We are offering this exclusive Scottish tour on various dates in 2019, please let us know of your interest. Fulfil your childhood dreams of being the king/queen of your very own castle! Day 1 we meet you at Glasgow/Edinburgh Airport and drive north along the shores of Loch Lomond to Loch Long, then through the stunning mountain glen “rest and be thankful”, stopping at the top to look back. From on to Inveraray where lunch can be taken, also shopping and perhaps a visit to the Campbell Castle there? Then travelling through great scenery to Kilmartin village and a wee drive to your castle! 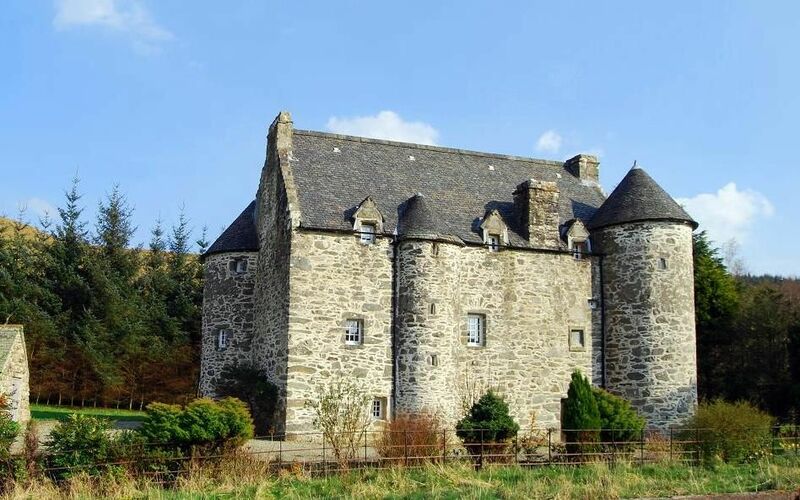 Kilmartin Castle; 500 year old Kilmartin Castle, Argyll … following extensive refurbishment at the loving hands of the current owners, Kilmartin Castle is now open for the first time in over 400 years as a self-catering home away from home. Fulfil your childhood dreams of being the king/queen of your very own castle! Originally built in 1550 for John Carswell, Rector of Kilmartin Glen (later Bishop of The Isles), just 1.5 miles north of Kilmartin. It’s a basic hideaway, clean and minimal, with a selection of quirky vintage furniture/artwork throughout that fits the castle’s ‘rustic luxury’ aesthetic perfectly. 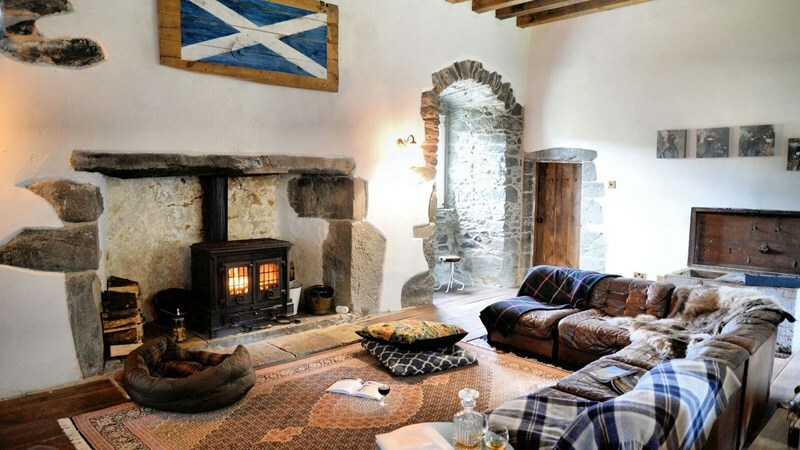 The creaking wooden doors, exposed stone fireplace and wooden flooring, covered in rugs throughout, give the castle an incredibly homely feel. The three bedrooms each with en suite bathroom within the turrets consist of two double bedrooms and a twin. The grand hall is perfect for quiet nights in, sat around a roaring fireplace, cosy up on the couch, lounge on Persian rugs, with a dram of Scotland’s finest in hand! The kitchen is equipped with all the modern amenities. 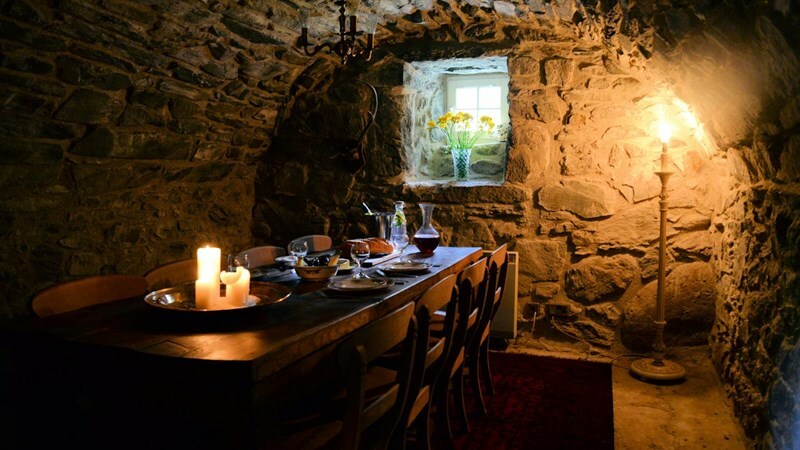 Your driver leaves you here for the night – or can collect you later and take you to the inn. Meals drinks and outside areas for your convenience. We can arrange a professional chef to attend you at the castle for dinner or a full banquet. Day 2 your driver takes you an hour north to Oban, where you take a ferry to the Isle of Mull. Visit Duart Castle, home to the Chief of Clan Maclean. Then up to Tobermory, the islands’ capital – one bank , a couple of bars and cute shops. Time for lunch at Macgochans pub, Tobermory Distillery if you wish. Back to Oban for some free time, then drop into a supermarket to do your grocery/drinks shopping. Return to your castle. Day 3 a historic day, visiting Kilmartin Glen, with standing stones, burial cairns older than the pyramids, 5000 years to be exact. Then to Crinan via the canal of the same name, lunch time here at the basin/lock gates. Return to the castle via a different route. Dine in or out, just let us know. Day 4 Tarbert is only 20 miles away but a slow winding that takes us a wee while. http://mcleanscotland.com/kintyre-castle have a read and you will understand some of what we shall be seeing today. Back to the castle for a final night. Day 5 driving north then east via Loch Awe and Dalmally, we head to Killin for lunch, near the Falls of Dochart. Then down Glen Ogle to Crieff and on to Perth, with stops en route – an amazing day of sightseeing and country stops. Overnight in Perth, where we are based, we know where to eat, drink and sightsee here in the ancient capital of Scotland, set aside the River Tay, Scotland’s longest river. Why not enjoy a few drinks in the King James bar, King james was murdered here a while ago! Things have got better since. Day 6 sadly the final day, we return to Glasgow or Edinburgh for a final night, time to enjoy your surroundings before homeward tomorrow.